Milwaukee Jobsite Markers feature clog resistant tips and the ability to write through dusty, wet or oily surfaces. 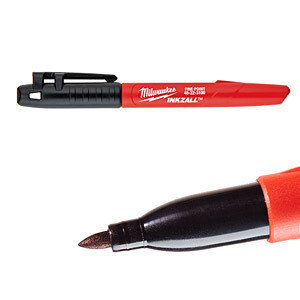 The durable marker tips are designed for writing on rough surfaces such as OSB, cinder block and concrete and the ink dries quickly to reduce smearing markings, without drying out quickly when the cap is left off. For added user convenience, the INKZALL® markers have a built-in hard hat clip for easy storage and access. INKZALL® markers confirm to Milwaukee’s commitment to best-in-class durability and their relentless mission to provide innovative solutions to the end user.